I never tire of telling people that Open Innovation is an amazing phenomenon. Happily, it disproves the old adage: Ask a silly question… Because, in fact, you don’t get silly answers. Nearly a dozen people, including several international experts in Oral Rehydration for diarrhoea, answered the question I posed last week – and we got some great responses. Fascinating reading. Well, I would say that . . . but you don’t have to be interested in diarrhoea to learn a few lessons on product development and marketing from the valuable insights people sent in. When you start to question why things are designed as they are, it’s surprising how often the design suits the manufacturer or the supplier or the scientist or the packaging people and not the customer. Either that, or it still conforms to an original brief that doesn’t fit the new status quo. So, why do ORS packets come in 1 litre sachets? What is the recommended dosage? And how do you make the instructions clear? Here are some of the things that our experts (and common sense non-experts) suggested. ‘Having one ORS product for the pharmaceutical company allows it to concentrate its product base and lowers cost of manufacturing different ORS size packets’. But hang on – that’s about the cost/benefit to the supplier, not the customer. 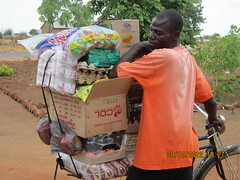 Again – these points look convenient for institutions, not the home-based customer in a remote village – who may not even know what a litre is, or have a litre measure to hand, and certainly doesn’t want to throw away what she doesn’t need, but, at the same time, shouldn’t leave the mixture standing around in the heat and the flies. ‘1 litre is a bigger volume so there is greater margin for error in dilution – making up 800ml or even 1.2 litres by accident doesn’t make a huge difference to the efficacy of the ORS’. Ahhh – but surely the answer to this one is to give them a measuring vessel? And… in spite of all the instructions, everyone agreed that the particular packet we were looking at was easy to misunderstand. ‘Selling a single product in a single dose involves significantly less regulatory red-tape than otherwise’. “When the one litre package was designed and promoted by WHO and UNICEF, it was intended for use essentially in health facilities. For home treatment of diarrhoea, the emphasis was put on homemade solutions. However, it is clear that more and more often ORS is being used at home and for home treatment a one litre package is clearly inadequate. “For home treatment of diarrhoea, studies have shown that the average consumption of ORS is 400ml per day for an average of two days…. And what we see in many countries is that mothers, especially in a very poor environment, who do not like to discard leftover solution, do not dissolve an entire packet of ORS in one litre of water, but just pour a little bit of powder in an undetermined amount of water, making a solution of unknown concentration, sometimes too diluted to be effective, and sometimes too concentrated to the point of aggravating diarrhoea through osmotic diarrhoea. 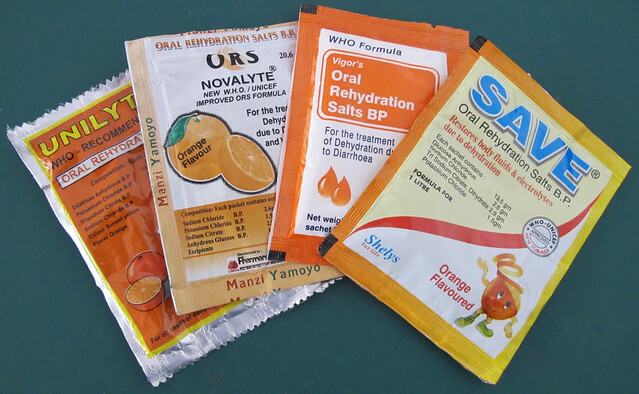 We are seeking to increase home use of ORS for the treatment of diarrhoea and so smaller sachets of flavoured ORS would be ideal. If the average consumption in the household situation is 400ml, then, on average, 600ml will be thrown away each day if we use sachets that make up a litre. The problem is that I have never seen smaller sachets for sale in Zambia except for a product called REHIDRAT. REHIDRAT makes up 250ml of non-WHO approved solution and is marketed as a ‘life style ORS’ for sports people and the like and sells for between three and nine times the price of the 1 litre sachets pictured above. Why don’t we use UNICEF ones? Zambia does not procure ORS from UNICEF and even if it did they would be distributed through the public sector free of charge. 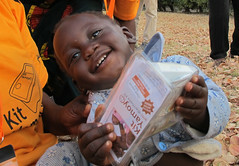 The ORS we distribute will be part of a kit with a recommended retail price on it. If it contained a readily recognised ORS sachet which was free from clinics people are likely to get suspicious. Ours will be a commercial product and so needs to look like a commercial product. It’s time to pound the streets to see if we can find someone who can make them! This is not part of our carefully thought out plan.